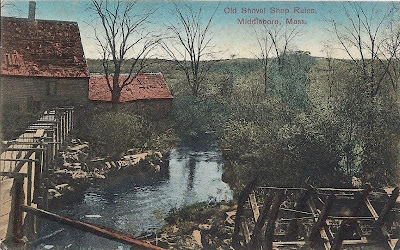 The Nemasket River at Wareham Street in Middleborough was once part of the industrial complex known as the Upper Factory that included a cotton mill, shovel works, grist and saw mills, and a forge. It was here at the Upper Factory that the last shovels manufactured in Middleborough were made in 1883. Shovel manufacturing at the Upper Factory had been inaugurated by Peter H. Peirce and others during the first quarter of the 19th century, and continued under the Nemasket Manufacturing Company, on the now wooded site directly across the river from the park, the present concrete dam being the location of the shovel works dam. In 1867, the entire Nemasket complex was sold by the Peirce heirs to William L. Brown and Nathaniel B. Sherman of Boston, and Peter Washburn of Middleborough. Brown removed to Middleborough to supervise the works, though Sherman remained behind in Boston. Due to the nature of shovel making at that time, fires proved a recurring problem for Brown, Sherman & Washburn. The worst occurred November 7, 1868, when an early morning blaze ignited at 5:30 in the varnish room located adjacent to the finishing shop in which handles were fitted to the shovel heads. The fire spread and, ultimately, consumed the entire shovel mill. Though "the whole insurance for all the buildings of Brown, Sherman & Washburn amounted to nearly $30,000," unfortunately on the burned buildings it totalled only about $3,000, while the damage amounted to some $15,000. The firm, however, did receive "the kindliest expressions of sympathy and offers of aid," including an offer by Lazell, Perkins & Company of Bridgewater to repair the shovel works machinery if transported to Bridgewater. It was, in all probability, this discouraging state of affairs which prompted Washburn to sell his quarter share of the business to his two co-partners later that November. It has been stated that the ruins from this fire remained on the site until being demolished in the early 1900s, but this, in fact, was not the case, for the mill was rebuilt immediately after the fire. During the three months following, the firm retained all hands, a fact for which, the Plymouth Old Colony Memorial praised Sherman: "Mr. S. has no superior as a prompt, energetic business man, with a broad and generous philanthropy as a christian merchant." The works were restarted as Brown & Sherman in February, 1869, in two new buildings which had been raised to replace the destroyed structures. In June 1870, Brown sold his interest in the business to Sherman who operated the firm as N. B. Sherman & Company and, later, as the Middleboro' Shovel Company. Sherman continued to reside in Boston where the company office was based. By 1872, the company was operating successfully, entering into a period of commercial stability. At the time, the quality of the product was so high as to merit representation at the Vienna International Exposition in the form of a case of extra-finished shovels. The Middleboro' Shovel Co. are driving business full blast, running night and day, with orders that will require their full active force weeks to fill. The George T. Richardson shovel [produced there] is pronounced a complete tool, made of solid cast steel, light weight, and graceful in form. The handle is firmly connected, the bands that hold it being part of the shovel itself, and serve to do away with those awkward straps that have always proved such a nuisance. The prosperity of this concern is owing to wide-awake enterprise and business tact and ability. In the last months of that same year, 1875, "extensive business" for the firm was still projected, and consequently the works were put into repair in October and November. 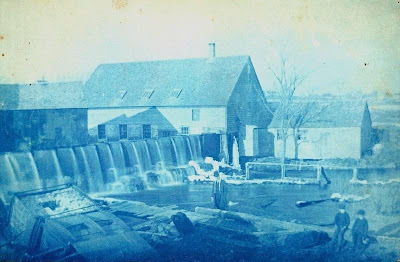 Nonetheless, the Nemasket River, which powered the mill, could prove uncooperative, and periodic shutdowns and the working of half-time were sometimes necessitated by the lack of water flowing in the river. Despite the apparent success of the company, financial disaster loomed during the summer of 1877. On August 2, the Plymouth Old Colony Memorial tersely reported the startling news: "The Middleboro' Shovel Co., of Boston, has gone into bankruptcy." While there was some hope that the enterprise might be reestablished, this proved more a long term aspiration rather than an immediate goal in 1877, and "most of the experienced shovel workers" relocated to the works at East Taunton, including George T. Richardson, who accepted the position of foreman at the East Taunton Works. The remaining stock was sold to the powerful shovel manufacturing firm of Oliver Ames & Son of Easton and the water privilege at the dam leased to that same firm, leading the Memorial to quip that "at last all that was left of the thriving Middleboro' Shovel Company's Works has been swallowed up by the great shovel anaconda at Easton." With the loss of such an important industry, the "Middleboro' people are consoling themselves with the fact that when other manufacturing concerns had suspended still the prosperity of that town went right on." Despite this unforseen turn of events, the failure of the Middleboro' Shovel Company did not mark the end of shovel manufacturing at the Upper Factory. In the spring of 1882, the Ames began making improvements at the site "with a view of starting up a branch of their works" there. Later that same summer, the Ames lease expired and it was left to Sherman to restart the works, though it seems that he may have done so with the assistance of the Ames family. Extensive repairs continued throughout late 1882, and "after a long period of idleness," the shovel works were once more successfully reestablished by Sherman, commencing operations again as early as 1883, at which time the entire plant was valued at $25,000. Nonetheless, Sherman seems to have been contemplating the sale of the works, it being reported in March, 1883, that "parties are negotiating for the purchase of the Shovel Works property." Apparently, one interested party which expressed an interest in purchasing the water privileges was the Town of Middleborough. Tragically, before a buyer could be found, fire once more destroyed the works on January 3, 1884, consuming both the main building and the hammer shop. Little was saved, except the stock of finished shovels ready for market, and the company safe. Insurance covered only about half the loss, and the disaster proved insuperable, "a serious disaster to the business interests of the town, as they ... bade fair to become an important industry" once more. The January, 1884, fire marked the final end of shovel making in Middleborough. Efforts were made by Fall River parties to entice Sherman into building in that city. The hope of yet another industrial resurgence at the Upper Factory continued to remain a possibility until 1889 when Sherman sold the cotton mill privilege to the Middleboro Electric Light & Power Company, thus bringing to a close the industrial history of the site. 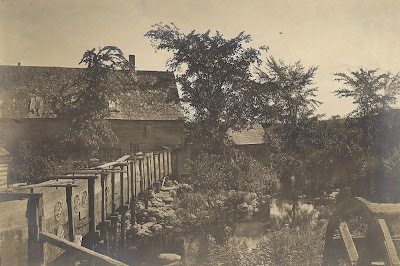 This early view of the shovel works at the Upper factory depicts the saw mill which operated as part of the works and which was located on the west bank of the Nemasket River. The view is taken from a vantage point roughly near the foot of the present fish ladder which descends from Wareham Street. Note the wooden sluiceway which carries a stream of water from the dam to the mill. The shovel works building is just out of view on the left. 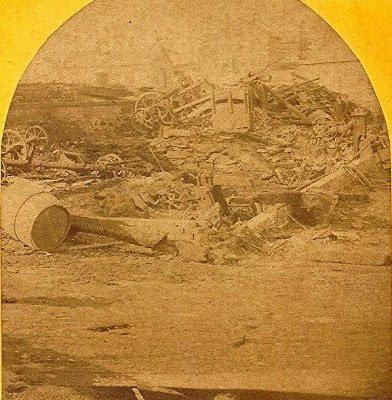 This stereocard depicts the wreckage from what was probably the 1884 fire at the shovel works. Clearly visible is the gearing and shafts which provided the motive power for the operation. The entire shovel works was not destroyed. The buildings on the west side of the river remained including the saw mill, a building which was used in 1885 for lumber storage and the combined pattern store house and wagon shed which stood further downstream. Here the saw mill appears in reasonably good repair, but once abandoned it along with the other buildings would quickly decay. By 1891, they were described as "old and dilapidated". Notice the water wheel in the right foreground. 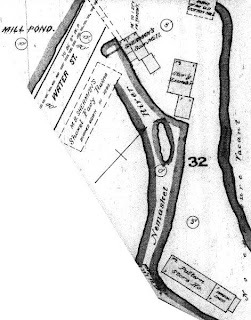 The map shows the location of the principal shovel works buildings in 1885, as well as the former site of the main shovel-making plant which stood just on the north side of the dam. Water Street is now known as Wareham Street. This postcard view was taken from a similar vantage point as the photograph above, but several years later. The passage of time has brought decay to the buildings which are in apparent disrepair as is the waterwheel in the foreground which has fallen to pieces. The buildings remained until March 24, 1910. "The last vestige of buildings on the shovel shop property at Wareham st is flat. The old saw mill was blown down yesterday." [Brockton Enterprise, "Middleboro", March 25, 1910]. The photograph depicts the Nemasket River at the Upper Factory today. The Shovel Works site, is on the far bank of the river straight ahead. Largely wooded today, there is little evidence of the site's former industrial complex.